I did a post on here about my favourite children’s movies, and noticed that, out of my top five films, I had read the books for all but two of them — Mary Poppins and Chitty Chitty Bang Bang. So, I took it upon myself to make a mental note to read these titles as well, and not long after I picked up Mary Poppins in the bookstore. This is such a tricky thing to do, to compare book with movie, because I truly believe that it is usually whichever version you experienced first that you like the best. Now, this is not always the case, and sometimes this opinion can later change, but from what I have noticed about my own personal tastes, as well as what I have uncovered from those around me, it seems to be a trend. So, I hate saying it, but I will nonetheless…I enjoyed the movie more than the book! But I truly believe that Disney took the bare bones of an interesting story, and made it something magnificent. The book is full of quirk, and it has that lovely element in which Mary herself is well-acquainted with strange goings on, though later avoids or vaguely denies such a thing ever happened. I think, all in all, if Jane and Michael did not have each other and the book focused on only one child, this “did they or didn’t they” act would be frustrating. However, with two of them, they have each other for assurance, and thus it makes the whole thing a terrific game in which everything happens, but really, Mary just pretends it does not. Mary, however, is handled much better in the film than she is in the book. In the book, she is far too snobby. She is never nice to the children, and it is unbelievable that the children would really grow that attached to her, strange happenings or not. She is vain and annoying, and really hard to like. The movie, however, kept her cross and strange, but also added a gentle touch by making her smile knowingly at the children in a way which indicates that she does, in fact, care. Furthermore, the film Mary Poppins makes a comprehensive story out of these adventures. Mary comes when there is trouble at home, and through her strangeness, she reconnects the family, and only leaves once things have been put right. In the book, she just appears, and when she leaves, she lies to the children and then just ups and goes! 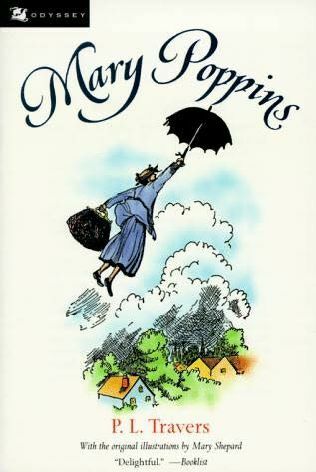 Generally speaking, the stories in the book version of Mary Poppins are still enjoyable. They are fun and interesting, and many of them are different than what is seen in the movie. The general concept behind Mary’s appearance and disappearance, however, and the character of Mary herself, are much better in the Disney film version.